Is Laminate Flooring easy to install ? wood is naturally formed on a tree and every floor is different. Laminate flooring is basically like sticking a bunch of repeating posters to your floor with a picture of some wood on them – hardly the same. Also, laminate floors will often curl up and get spoiled if you drop water or other liquids on them. This generally makes them unsuitable for bathroom and kitchen use, unless they have been specially treated for it. Lock is the new generation installation system from Tarkett. 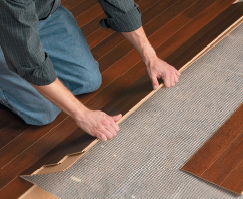 It is a fold-down installation click system for parquet and laminate floors that allows easy and fast floating installation. It takes 50% less time to install the flooring, only one person is needed and it is suitable even for large rooms! The 2-Lock installation system is also one of the strongest and most durable installation systems on the market. For your convenience, you can find this click system on most of Tarkett laminate and wood floors.